I would love one like Eva Longoria-Parkers dress on that cover. any suggestions BB?? I wore the EXACT same dress for NYE except in silver! I got it at Macy's. 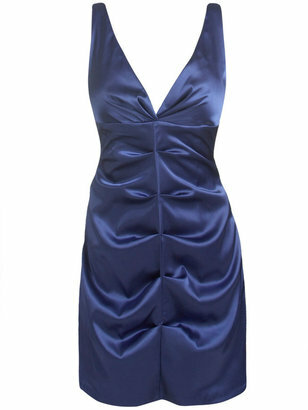 With the right lining the ruched look is totally flattering. She looks great! That Express dress is the ONE bandage dress that doesn't look trashy/clubby as so many of them do. The royal blue hue works too! I meant to ask you BB and sorry if you've posted this, but did you get your Gojane shoes? How were they? 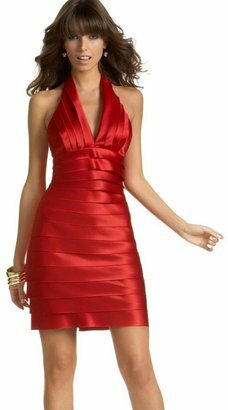 I have a dress that looks REALLY similar to the dress you want and I got it at forever21.. however its more of a stretchy material and less prom-ish. but the way it overlaps and folds is practically identital! Mines was red though, and I got it awhile ago.. I don't know if you live near a T.J. Maxx, but I was there over the weekend and they have several bandage dresses. There was a dead ringer for the BCBG one for $19.99 that I would have bought in a second if only I had somewhere to wear it.